Sunday, June 17th To celebrate all the fathers out there, all dads get in free with one paid admission. Wednesday, July 4th To honor our Nation’s Military & First Responders, all active, reserve, or retired military and first responders may enjoy River Run for free with the presentation of an ID, badge or license. Saturday & Sunday, September 1st & 2nd Celebrate the end of the season with ½ off all concessions for the ENTIRE last weekend. Tuesdays in June & July from 4 - 6pm Come show off your artistic abilities and beautify the pool deck with chalk. Thursday’s at 5pm in the Activity Pool CANNON BALL!!! Compete with other pool goers for the Biggest Splash of the week. Fridays at 5pm “Rent” a rubber duck for $1 and watch them race down one of our slides. All proceeds go to “Our Place” In New Albany. Winner receives a free concessions basket! Mondays from 5:15 - 7pm Come show off your volleyball skills in our brand new inflatable volleyball court! 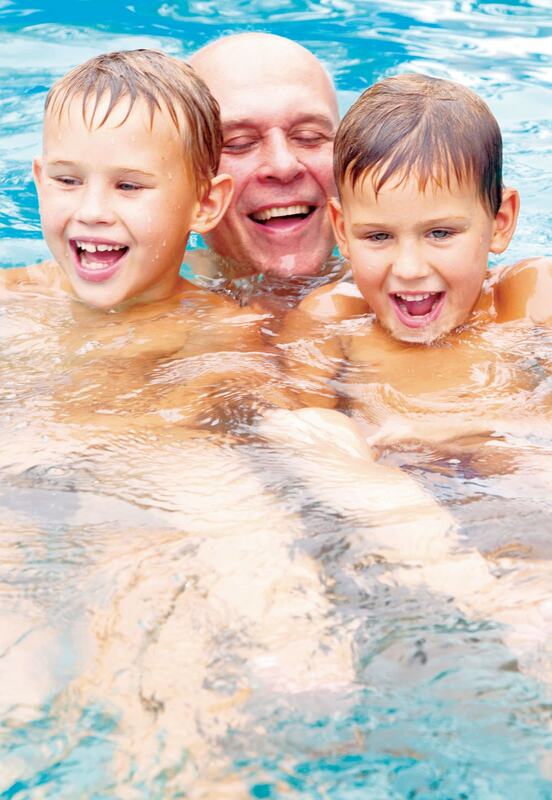 Wednesday, June 27th & Wednesday, July 18th | 3 - 6:30pm Join us for an afternoon of family fun yard games poolside.